Has a Loved One Died Due to the Negligence of Another Person? The loss of a loved one is devastating for families. The emotional trauma can make just getting through the day a real accomplishment. When a loved one has died due to the negligence of another person, families often want justice for their lost loved one. The Max Meyers Law team can help. Washington state law allows certain family members to make wrongful death claims against negligent persons who cause the fatal accidents. Not all family members are allowed to do this, so it’s critical a victim’s family understand their legal rights before speaking to any insurance companies or accepting any settlement offers. 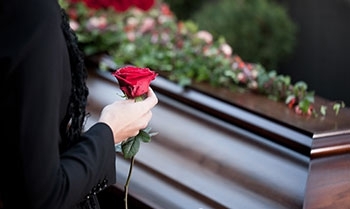 In almost all cases, families would greatly benefit from the assistance of an experienced wrongful death attorney. We at Max Meyers Law PLLC have handled car accident cases involving the death of a child and motorcycle accident cases involving the death of the rider. The spouse, children, or parent of a child killed in an accident often need the burden of a legal claim lifted from their shoulders. We understand you want justice for your loved one, but burden of this on your own likely seems overwhelming. The Max Meyers Law attorneys and staff have experience helping grieving families negotiate life after such a traumatic event. If you have lost a loved one in an accident, which was caused by another driver or the negligence of another person, contact the team at Max Meyers Law at 425- 399-7000 to request a free case review and legal consultation with our attorneys. Medical bills. In most cases the hospital expects their bills will be paid despite the death of the patient. Families are often doubly hit financially in fatal accident cases. Families often lose the income of their lost loved one and then are faced with massive medical bills. An experienced wrongful death attorney can often help negotiate these bills at times, and make sure health insurance, if available, covers what is required under the policy. Lost wages and lost future earnings. Family members who were financially dependent on the lost loved one may be able to recover damages for the loss of that financial support, for example spouses and minor children. How much is recoverable is often based on past, current and future employment earnings of the lost loved one. The education background and future job or career prospects can also influence the damage recovery amount. Pain and Suffering. Often accident victims do not die from their injuries immediately after the accident. If a victim survives for a period of time following the accident, the victim may experience significant pain and suffering during that time. When this happens, it is definitely included as part of the damages claim in a wrongful death lawsuit. Loss of consortium. One aspect of a lost loved one is you never have the ability to experience that one-on-one relationship with that person again. Lost companionship of a spouse or parent of a minor child can be emotionally devastating. This type of damage is recognized and can be claimed by grieving family members. Funeral expense. A modest burial often is shockingly expense, often costing families well over ten thousand dollars. These direct damages can also be recovered in wrongful death cases. The wrongful death attorneys as Max Meyers Law are ready to review your wrongful death case for free. If we believe we can help you achieve a better outcome for your case, we will meet with you in person for a free legal consultation to discuss your case in more detail and explain why hiring an experience lawyer is in your family’s best interest. Call us today at 425-399-7000 or use our confidential contact form to request a free consultation. It is important to know there are other factors that affect a person’s ability to bring a wrongful death lawsuit. It isn’t enough that a negligent person killed your loved one. You must also fall within the specific class of family members allowed to bring wrongful death claims. The Max Meyers Law attorneys will discuss the details of these requirements during your free consultation.